CAPSTAR Green an adult female flea can lay up to 2,000 eggs in her lifetime. With CAPSTAR by NOVARTIS, almost all your dog's or cat's adult fleas will be gone within four hours. 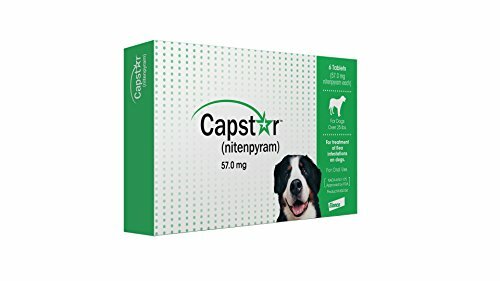 How to Use A single dose of Capstar (nitenpyram) should kill the adult fleas on your pet. If your pet gets reinfested with fleas, you can safely give another dose as often as once per day. To administer CAPSTAR tablets, place the pill directly in your pet's mouth, or hide it in food. If you choose to hide the tablet in food, watch closely to make sure your pet swallows the pill. If you are not sure that your pet swallowed the pill, it is safe to administer a second pill. We recommend you follow up CAPSTAR treatment with a monthly flea control product such as PROGRAM, Frontline or Advantage. Then keep CAPSTAR on hand for the times when there is a visible flea re-infestation. CAPSTAR Green for Dogs Over 25 lbs. 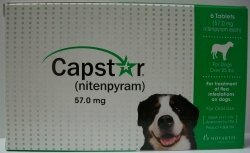 (60 Tabs) A single fast acting dose of Capstar (nitenpyram) should kill the adult fleas on your pet. If your pet gets re-infested with fleas, you can safely give another dose as often as once per day. To administer CAPSTAR tablets, place the pill directly in your pet's mouth, or hide it in food. If you choose to hide the tablet in food, watch closely to make sure your pet swallows the pill. If you are not sure that your pet swallowed the pill, it is safe to administer a second pill.We recommend you follow up CAPSTAR treatment with a monthly flea control product such as PROGRAM, Frontline or Advantage. Then keep CAPSTAR on hand for the times when there is a visible flea re-infestation. 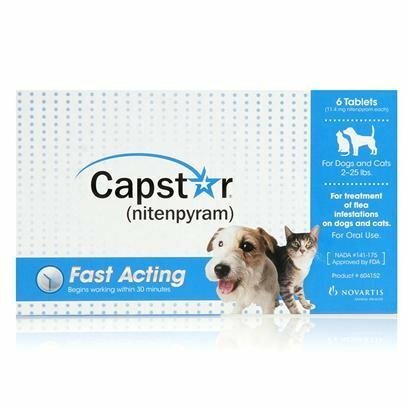 Capstar small dog/cat oral tablet kills fleas and is for the treatment of flea infestations on dogs, puppies, cats and kittens 4 Wks of age or older and 2 lbs body wt or greater. Begins working within 30 mins - 90% Effective against adult fleas on dogs within 4 hrs and on cats with 6 hrs. Kills fleas that may cause Flea Allergy Dermatitis. Contains 11.4 mg nitenpryam per tablet. 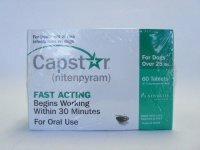 Capstar (nitenpyram) is an orally administered tablet that provides fast flea relief. In fact, Capstar starts working within 30 minutes. A single dose of Capstar should kill the adult fleas on your pet. If your pet get reinfested, it is safe to give another dose as often as once per day. Directions & Dosage Give 1 57mg tablet orally to dogs weighing more than 25 pounds per day until fleas can no longer be found on your dog. Ingredients The active ingredient of Capstar, nitenpyram, is a novel molecule belonging to the chemical class of neonicotinoid compounds, which bind with and inhibit insect specific nicotinic acetylcholine receptors; however, it does not inhibit acetylcholinesterase. It interferes with normal nerve transmission and leads to the death of the fleas. Nitenpyram is very rapidly and almost completely absorbed from the gastrointestinal tract of cats and dogs; feeding does not influence absorption. On average, the maximum blood concentration is reached 1 hour (range: 15 to 90 minutes) after administration in both species, and the elimination half-life is about 3 hours in dogs and 7.5 hours in cats. More than 90% of the active ingredient is eliminated in the urine within one day in dogs and two days in cats, mainly as unchanged nitenpyram. Nitenpyram starts working rapidly after dosing and kills >98% of the fleas on the pet within 6 hours; all adult fleas are eliminated 24 hours after a single treatment. Fleas can show up unexpectedly. When your cat or dog has a sudden outbreak, Capstar Flea Killer can help. It's a daily, oral caplet flea treatment for dogs and cats who are 4 weeks and older and weigh 2 pounds or more. Capstar Flea Killer begins killing fleas within 30 minutes and last up to 24 hours. Capstar Flea Killer is not a flea preventative but a fast-acting flea killer. Best of all it's safe for pregnant or nursing dogs and cats. 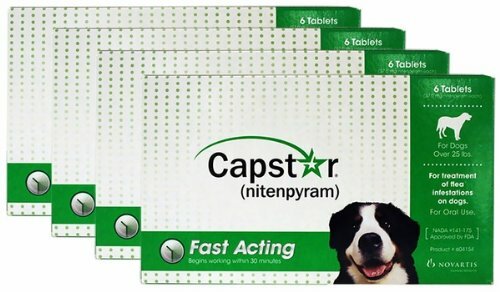 Immediate Relief, Capstar is a tablet used to kill fleas on dogs and cats, which begins working within 30 minutes.